Here is the best, cheapest and easiest way to record a podcast in Mac OS X. This will be using GarageBand, LineIn, Skype and Soundflower – all free software! The only thing you’ll need to purchase is a quality microphone. 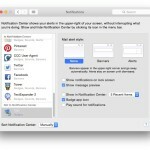 This post is about how to set up your Mac in order to record remotely over Skype. That is, this is about recording a podcast with a remote caller via Skype and getting the audio from both sides of the conversation – something that has a history of being fairly tricky. Make sure you have GarageBand. GarageBand comes free with any Mac and has been installed by default on new Macs for a long, long time now. If for some reason you don’t have GarageBand (or maybe deleted it), you can download it here. 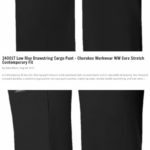 Download LineIn. It’s a simple yet powerful app. (And trust us, this is all legit software!) 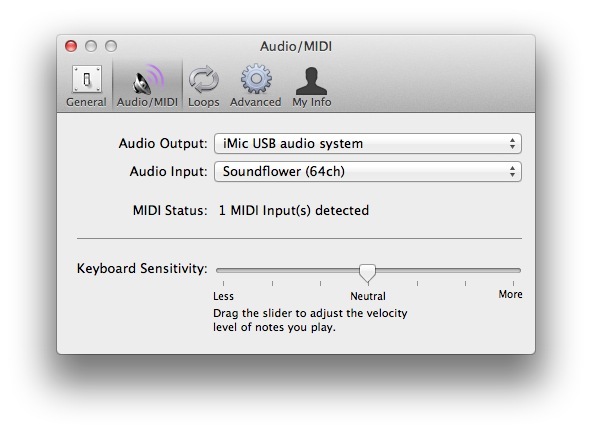 It lets you change your audio input devices (more on that later). Download Soundflower. Another simple app that lets you route audio to different places. Download Skype for Mac. However, you’ll need an older version of Skype to get audio from it. Go here to oldapps.com and download “Skype 2.8.0.866”. 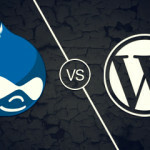 Typically the default settings should work for you. But to double-check and make sure here are the settings you need. 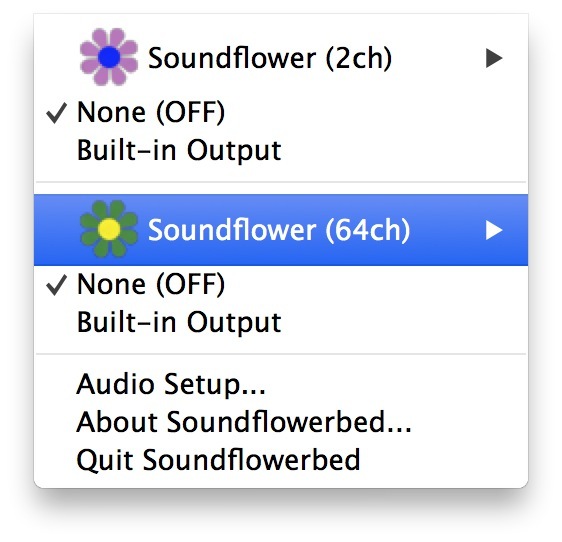 Make sure that both Soundflower (2ch) and Soundflower (64ch) are both set to NONE (OFF). Then under Soundflower (64ch), make sure that Channel 1, Channel 2 and Channel 3 are set to NONE. That’s all you need to do for Soundflower. LineIn is also a very simple app with just a few settings. “Input from:” should be set to the input device you’re recording from, typically a Microphone. You can use your Macs built-in microphone (select “Built-in Microphone: Internal microphone” from the drop down menu) although we suggest a better mic than that if you want your podcast to sound good. 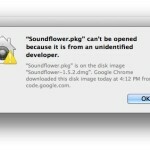 For “Output to” select Soundflower (64ch). 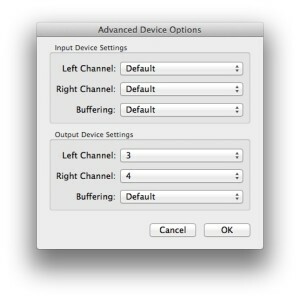 For Input Device settings for Left Channel, Right Channel and Buffering, leave at Default. 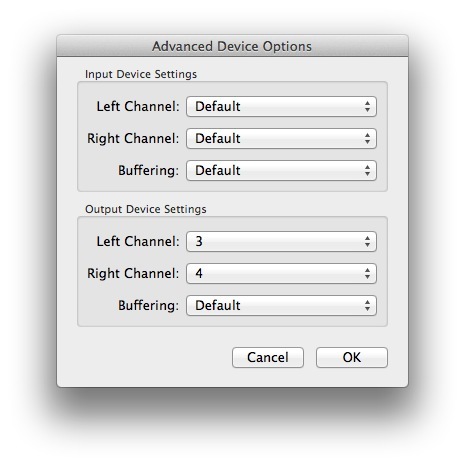 For Output Device settings, set Left Channel to 3 and Right Channel to 4. Leave Buffering at Default. Then hit ok to go back to the main LineIn window and click the “Pass Thru” button. Clicking Pass Thru allows audio to literally pass through LineIn using the settings you just modified. You should see active audio “lighting up” blue around the pass thru button if you talk into your mic. Basically what we’re telling LineIn to do is direct audio from your Microphone to Soundflower. In Skype, go to the Skype menu -> Preferences. 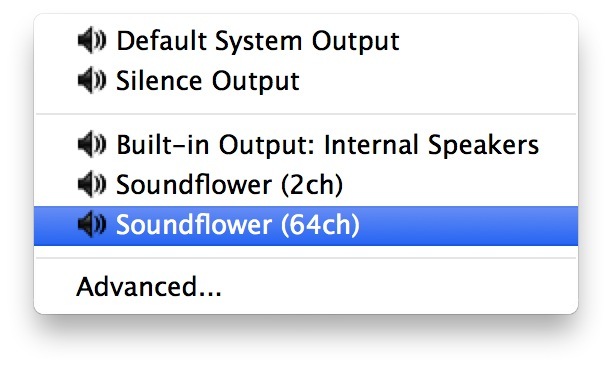 For audio output select Soundflower (64ch). 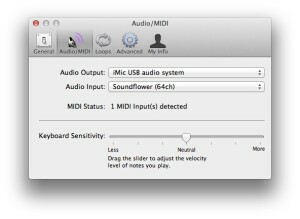 For Audio input select your mic (in my case, iMic USB audio system). Ringing can also be Soundflower (64ch) although you might want to change this to Built-in output so as not to be recorded. That’s all you need to do for Skype. We’re not going to get in-depth about how to record a podcast in GarageBand. This is moreso about how to set up GarageBand to have the proper audio. In GarageBand, go to the GarageBand menu -> Preferences. Click on the Audio/MIDI tab. For Audio Output, select your mic. That’s all you need to do in the GarageBand preferences so close that window. You need to have 2 tracks to record on – one will be your local Skype audio (yourself talking) and the other will be the remote Skype connection (audio of one or more callers). To make a 2nd track go to Track -> New Track, select Real Instrument and click Create. You also need to enable multitrack recording, otherwise GarageBand will just get audio from one track. Go to Track -> Enable Multitrack Recording. You need to make sure that both of your audio tracks will be recording. 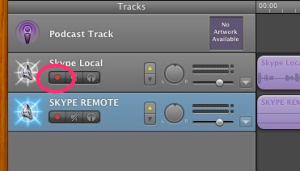 This is the little dot as shown below – make sure that it’s red otherwise that track won’t be recorded. The red dot that needs to be on. Double-click on your first audio track. This should bring up the Instruments panel on the right. You could also hit command-I or go to Track -> Show Track Info. Down in the bottom right (as pictured above), for Input Source select Mono 1 (Soundflower (64ch)). I like to put recording level at 100% and adjust elsewhere if that’s a problem. Click Save Instrument and give it a name like SKYPE LOCAL, that way you know what track it is. Now click on your 2nd audio track. In the bottom right this time for Input Source select Stereo 3/4 (Soundflower (64ch)). Leave Monitor on Off and put recording level at 100%. Click Save Instrument and give it a name like SKYPE REMOTE. Now we’re ready to test and make sure that audio is flowing properly and everything is configured properly. Hit record in Garageband (or command-R) and then go to Skype and start a test call. You’ll hear a nice British female voice. It’ll even record what you say and play it back to you to make sure everything on Skype is working. Hell yeah, congratulations! Hopefully it didn’t take you the eons it took us to get it working. First, simmer down and go back through your settings slowly. There are so many moving parts that maybe something wasn’t set right. Patience, grasshopper. No “HULK SMASH” allowed. It’s probably one little setting somewhere. Next, you could also check your sound preferences. Go to System Preferences and then Sound. Make sure output is on Internal Speakers (or however else you want to listen to the podcast as it’s being recorded) and that input is set to your microphone. Make sure that LineIn is set to Pass Thru and that you see audio when you talk into your mic. 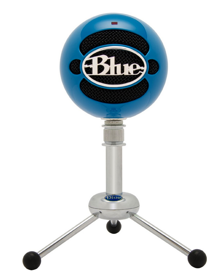 The Blue mic is $69, sounds great and is easy to use. It’s one of the best and cheapest podcasting mics out there, plus it wins some style points for all the cool colors it comes in. If you have questions or comments or other possible fixes, please address those in the comments below.